I was very excited for this week’s Paint-a-Story at the shop, both because I love Jon Agee’s There’s a Wall in the Middle of This Book, and because I could finally use some materials for our accompanying art project that I had stashed in the garage months ago — following a long, very satisfying rummage at our local hardware store, where the clearance shelves are a treasure trove of creative possibility for preschoolers and adults who like big messes. (OK, I was really there to look for a new garbage disposal… but how long can you do THAT?) As I have written about in Paint-a-Story Mondays; or, The Messier the Better, each Monday morning we gather with 25-35 preschool children and their grownups to read a picture book aloud and complete a “very messy” art project — sometimes experimenting with the materials or style of the book’s illustrator, and sometimes using found materials (and a lot of glitter and glue) to expand on the story and its theme. Our staff selects the book and provides the materials, but much of what is created by our guests is original, inspired, and worth oh-so-much-more than a refrigerator door gallery showing. 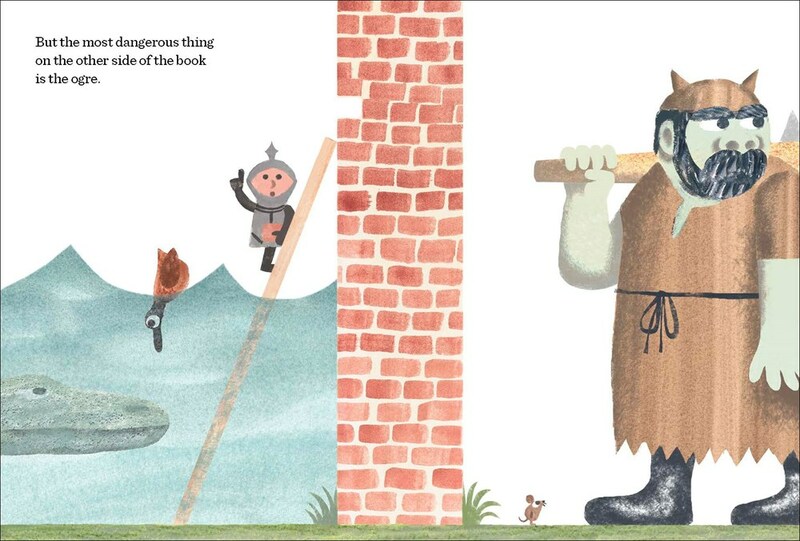 Our objective is to be more concerned with process than product, believing that open-ended experimentation with materials within the shadow of good stories makes literature real and tangible to young people — truly, we believe this is true for readers of all ages. 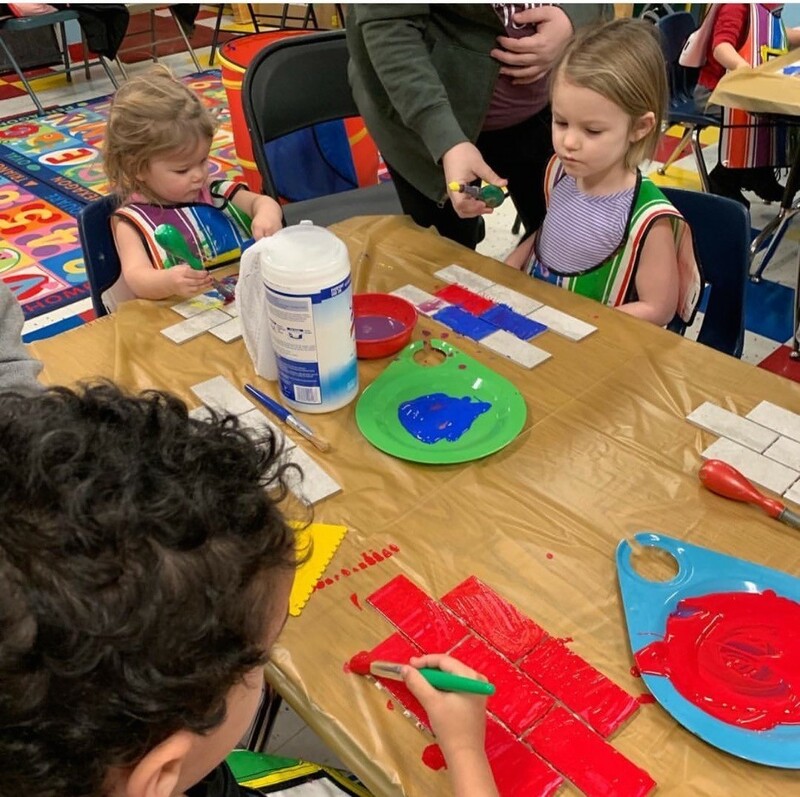 The topic of walls is much on our minds, and the weekend’s news stories were disheartening in their continued reminders of how divided and antagonistic our world can be. As I surveyed both my list of potential read-alouds and our available supplies (bless my tolerant husband and those shelves he installed in the back of the garage) the whole plan came together like bricks and mortar. 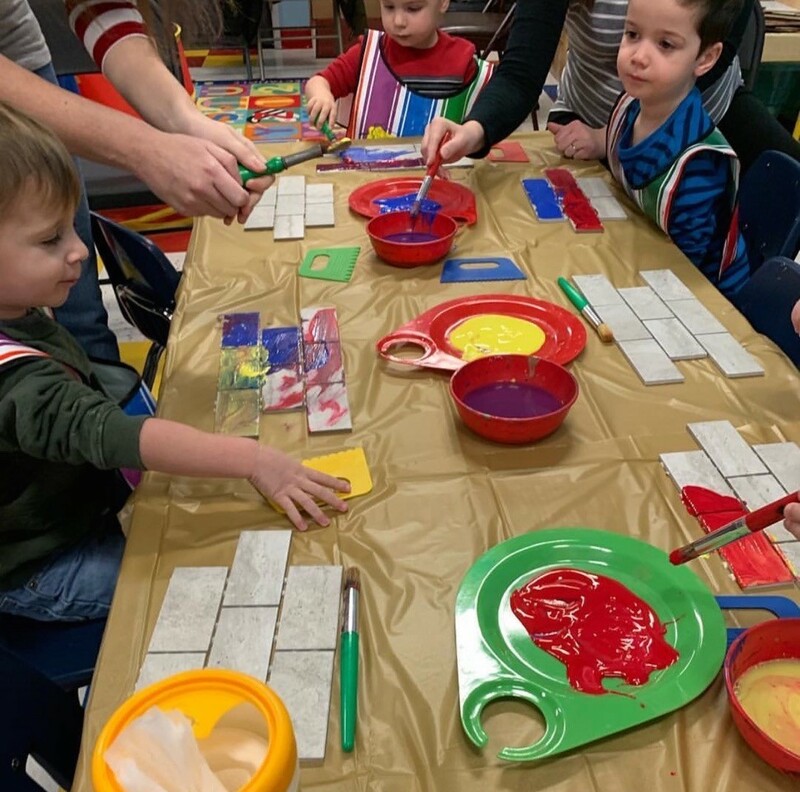 A clearanced box of ceramic tiles, some acrylic paint, and a collection of plastic “scrapers” became the building blocks of a very interesting morning. 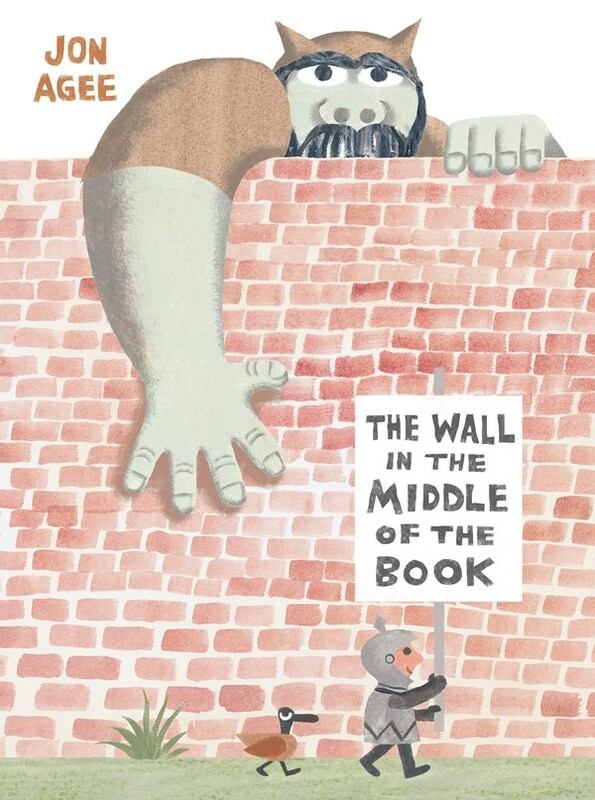 Jon’s book is actually (at least) two stories: the concerns of a knight on one side of a giant brick wall, celebrating his luck in being protected from the fierce wild animals and giant ogre who live on the other side, and an unexpected crisis in his own kingdom. 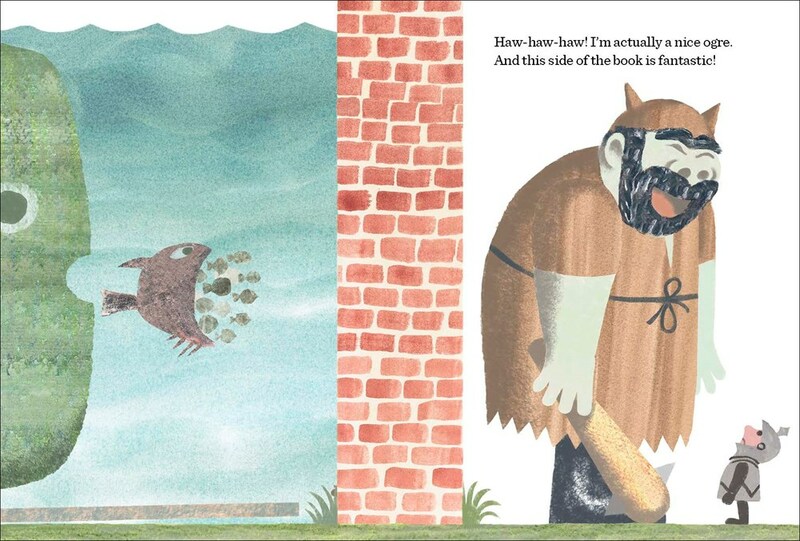 As the story progresses, the knight is threatened by an impending flood on his “safe” side of the wall. As the water level rises, he desperately climbs a ladder leaning against the protective brick wall to keep from drowning. 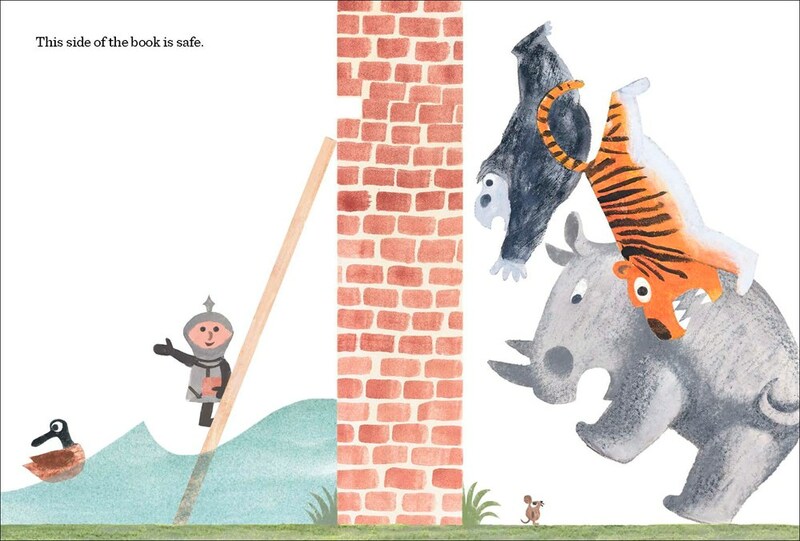 On the other side of the wall, the reader enjoys the wordless tale of the animals, climbing up in a pyramid to reach the top of the wall, but upset by a tiny mouse. Meanwhile, the knight continues to pronounce the “safety” of his side. At this point, my young friends’ attention turned entirely to the action under the water on the knight’s side. Oblivious to our poor hero’s distress about the potential dangers on the other side of the wall, they were indignant that he should “turn around and scoop up those little fishes and take them home!” As the ogre reaches over the brick barrier to rescue the knight and bring him over to safety, their focus stayed firmly on the welfare of the school of little fish, who unfortunately become lunch, and then in turn dinner for larger sea creatures. This entry was posted in Uncategorized on January 30, 2019 by Cynthia Compton. Clearly, we need to listen to children more often. Their instincts are much better than those of many “grown-ups” these days. 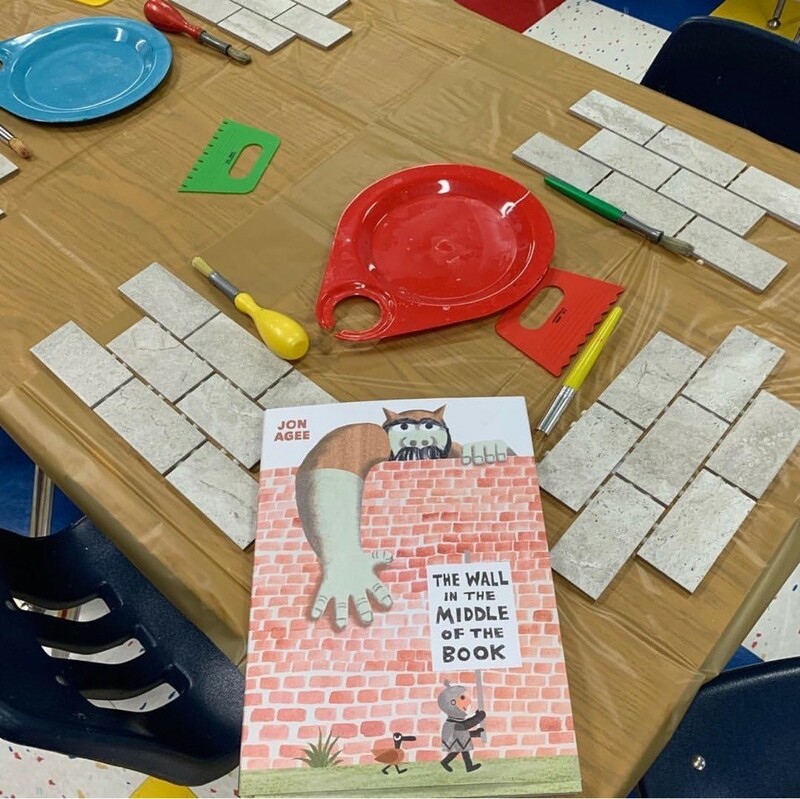 I LOVE this craft idea with this book – bravo! We need more of YOU, Mrs. Cynthia.